Kenya! Holy Smokes! Never Saw That Coming!!! : Happy Ugali Hanukah! With Michael away, hiking Mount Kenya, I guess I have to carry the torch on blogging. I know it’s been a while since I weighed in here. I’ve been working a lot – A LOT actually. It’d be nice to have more time for the other things that make up a life, but there’s also no substitute for meaningful work. Three months in, I can honestly say I must have the most interesting job in the world. The dynamic team of trainers that I work with travel throughout Sub-Saharan Africa to orient diverse groups of refugees to life in the United States. Refugees who are preparing to depart for the U.S. learn how the resettlement process works, the ins and outs of travel (boarding a plane, what that weird looking set of food items is, etc. ), what housing is like, the importance of learning English and working early on, and other essential kernels one might need to start over again in a completely different culture with a pro-active attitude and realistic expectations. We share some perspective on cultural adjustment – the impact when family roles shift to manage the demands of a new culture or the u-curve of cultural adjustment, the natural process most people go through – a honeymoon phase, a low and ultimately integration of the old and new identities. How perfect that I get to experience all of that firsthand, just as I help guide our team to make the transition as easy as possible for others. And, if my family has had some challenges (thank goodness, only minor ones) – imagine never having seen an airplane, not speaking English, not reading in your native language, and on and on. And so for us, family roles shifted a bit, too. It’s strange for me that Michael’s the one who knows what day Ruby has to bring her bathing suit, which day Matthew has P.E., which birthday party is happening this weekend… With Michael heading off for four days I got a little nervous that I’d know how to manage their schedules and someone would be there when the school bus arrives. Luckily, our new, caring and responsible “house help”, Margaret, has been solid, on top of it, and still poised and ready to have my coffee ready in the morning! Still, the proud mama in me is alive as ever. 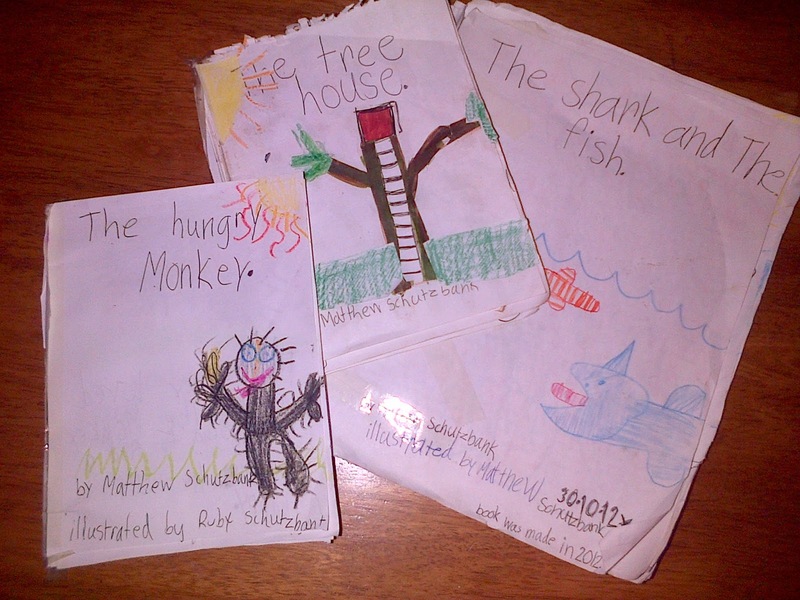 Yesterday I was in awe when Matthew showed me the book he wrote and illustrated all in one afternoon. Apparently, he was glued to his paper, completely engrossed like he sometimes gets. The thing is – this is his 4th book! And, one of those was a second edition of “The Shark and the Fish”. He brought them all to school today to show his beloved 1st grade teacher, and she apparently read two of them to the whole class during story time. I am so glad we left most of their toys in New York. What a lesson in how little kids really need. I think Margaret was confused today when we asked her to wash out the Mango Juice box so Matthew can use it as a toy. Over the weekend, my first weekend back after a conference in the U.S., we got to celebrate Hanukah at the Nairobi synagogue. It was quite the spectacle, complete with acrobats in the back garden and a hall full of menorahs. Tonight we celebrated the 6th night of Hanukah over a meal of Ugali and Sukuma – our first home cooked Kenyan meal (thanks to Margaret). And, Matthew and Ruby scooped it up with their fingers and ate it heartily like professionals. 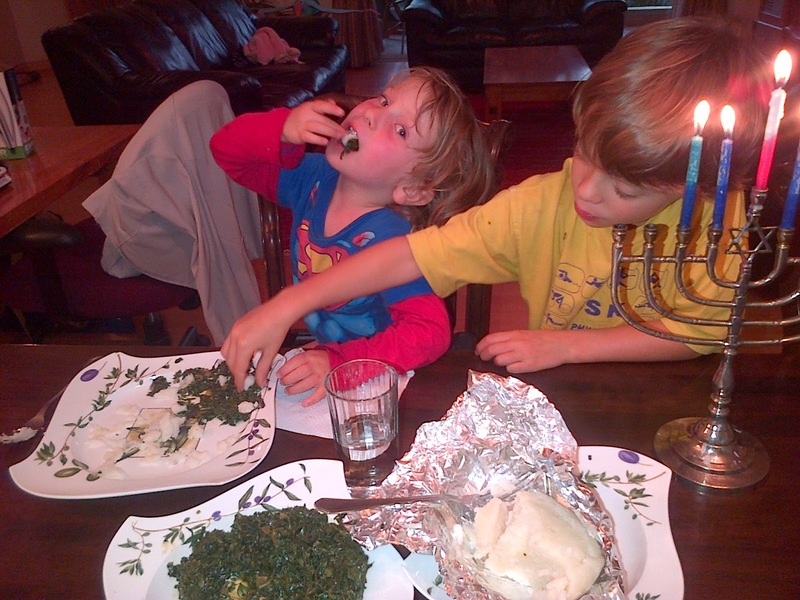 I guess it was another homage to integrating the old and the new - Ugali under the Hanukah candles. Perfect.